Life is indeed a “warfare;” and just as a man enlists in our army for a term of years, and then his service runs out, and he is free, so every believer is enlisted in the service of life, to serve God till his enlistment is over, and we sleep in death. Our charge and our armor we shall put off together. Brethren, you are soldiers, enlisted when you believed in Jesus. Let me remind you that you are a soldier, you will be always at war, you will never have a furlough or conclude a treaty. Like the old knights who slept in their armor, you will be attacked even in your rest. There is no part of the journey to heaven which is secure from the enemy, and no moment, not even the sweet rest of the Lord’s day, when the clarion may not sound. Therefore, prepare yourselves always for the battle. “Put on the whole armor of God,” and look upon life as a continued battle. Be surprised when you have not to fight; be wonderstruck when the world is peaceful towards you; be astonished when your old corruptions do not rise and assault you. You must travel with your swords always drawn, and you may as well throw away the scabbard, for you will never want it. You are a soldier who must always fight, and by the light of battle you must survey the whole of your life. That ye may be able to stand against the wiles of the devil; who is the grand enemy of Christ and his people, and a very powerful and cunning one he is; so that the whole armour of God should be put on, which is proof against all his might and craft, in order to stand against him, oppose him, and fight, and get the victory over him, which in the issue is always obtained by believers; for they not only stand their ground in the strength of Christ, and by the use of their armour confound his schemes, and baffle all his arts and stratagems, but are more than conquerors through him that has loved them. This scripture of Ephesians 6:11 Put on the Whole armour of God....NOTICE....this is basically a command not an option. He doesn't say well if you want to do this you can... NO He says Put it on and not only put it on ...put it ALL on!!! And He goes on to say Put it on so that you will BE ABLE to stand AGAINST The Wiles of the devil...the Tactics of the deceiver!!! So if He says put it on so that you will be able to stand against these tactics....what do you think it means if YOU DON'T? It's pretty plain isn't it? You Won't Stand If You Don't Do This!! Right? This verse of Ephesians 6:12 is basically saying. Hey people you are not dealing with people here ok...flesh and blood creatures. You are dealing with an unseen force..an evil force... darkness...wickedness....evil spirits.. So can you deal with an unseen evil force by flesh and blood means? NO YOU CANNOT!!! We fight these forces with the weapons the LORD has given us.. Prayer, Worship, Truth, The Word of God, Faith, Our Assurance of Salvation, Righteousness or Right doing, The Gospel of Peace. We OVERCOME The evil one by the Word of our Testimony and By The Blood Of Jesus Christ!!! Amen and Amen!!! And having done all to stand; or having overcome, having routed the enemy, stand as conquerors; or rather, having took and put on the whole armour of God, in order to stand, and withstand the enemy. 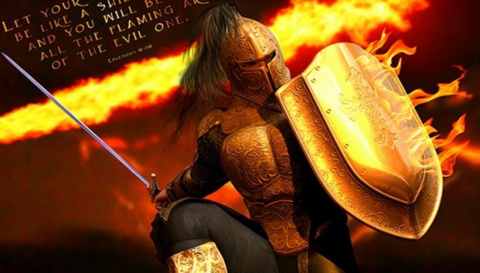 We are in the evil day and putting on the Armor of God is so crucial to our Spiritual welfare to be able to Stand As Conquerors and Overcomers in this hour. Once again this is Not an option It is a Command in order that we be ready and clothed for the battle and that we be able to Stand in this evil day.